club meetings for compliance and reporting? at your Events, Classes and other Meets! This software can help in your attendance reporting and record-keeping requirements for OSHA and other regulations. 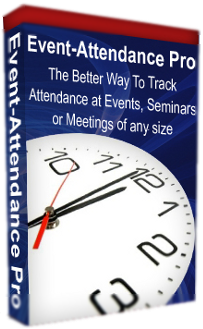 Event-Attendance Pro is a desktop software that allows you to track attendance at your seminars, conferences, classes, workshops, training events or trade shows using portable proximity card readers or barcode scanners. It is an affordable and very easy-to-use software product. Design and create custom name badges using Avery templates (#5392). Include a QR Code or Bar Code for attendance tracking.